If you sell with the help of outside vendors or Partners, a Partner portal might be the ticket. Users with a Gold Partner license can access the Documents tab, My Account Profile, Leads, Custom Objects, Approvals, Accounts, Cases, and Opportunities. Pricing got better on this type of license when the feature was renamed from PRM (Partner Relationship Management) to simply the Partner Portal licenses. There used to be three tiers, but as of July 2008, Bronze was dropped and only Silver and Gold remain. Silver Partner license can access the Documents tab, My Account Profile, Leads, and Approvals, and have 2 MB of data storage space. Access to Salesforce CRM Content is determined by feature license and profile. The price dropped when the tiers were consolidated. A Gold Partner license used to run $65 a month. Now it runs $35. 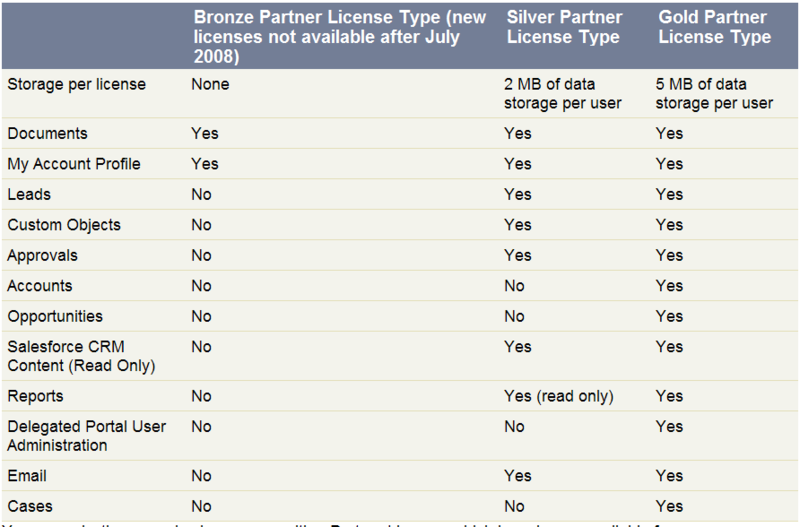 Note: As of May 2010, there will no longer be a "Silver" and "Gold" Partner license. According to my Salesforce.com rep, there is just a one-size-fits-all "Partner" license for $35 a month. The license does include access to Opportunities and Accounts (which would make sense).